The PNG prime minister used his time in Fiji to reiterate that both countries have an essential role in providing regional leadership. It is through this lens that O’Neill gave two speeches of note while in the Fiji capital, Suva. O’Neill also used his speech to acknowledge the shared interest both PNG and Fiji have in increased regional labor mobility. He indicated that this issue is not simply about generating remittances, but important for “brain circulation”; the ability of Pacific Islanders to obtain new skills and return to apply these in home countries, particularly in the areas of healthcare and education. PNG will be hosting the APEC (Asia-Pacific Economic Cooperation) summit in November. 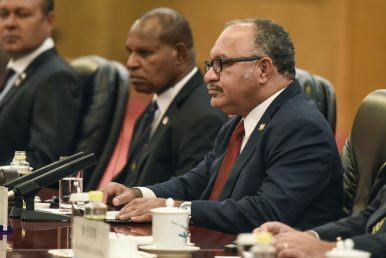 As the only Pacific Island country that is a member of APEC, O’Neill indicated that he saw PNG as a bridge between APEC and the Pacific Island countries, stressing that the agenda for the summit would be “of real relevance to developing economies.” The overarching theme for APEC is “Harnessing Inclusive Opportunities, Embracing the Digital Future,” and O’Neill stated that “this is all about improving connectivity for our people, promoting sustainable and inclusive growth, and enhancing structural reforms.” The prime minister also highlighted that he would be inviting all leaders of the Pacific Island Forum (PIF) who are not also members of APEC to attend the event (Australia and New Zealand are members of both PIF and APEC). At a second speech at the University of the South Pacific, O’Neill expanded upon this theme of Pacific Regionalism, making the case that multilateral organizations such as the Melanesian Spearhead Group (MSG), and the Pacific Island Forum (PIF), are essential mechanisms for advancing Pacific Island interests. He noted that Pacific Island countries are “often underestimated” within the global community; however, at the United Nations and a number of other global forums, as a bloc their votes become impactful. “[W]e can position ourselves in a strategic manner to draw attention from the international community,” O’Neill argued. As small states with considerable geographic and developmental hurdles, multilateral frameworks where collective concerns can be amplified are essential fora for Pacific Islands states. The PNG prime minister used his time in Fiji to reiterate that as two large Pacific Island countries PNG and Fiji have an essential role in providing leadership and solidarity on the region’s essential concerns, and enhancing the region’s cooperative architecture. Whether this approach can provide the necessary influence on its large, essential, but often deaf neighbor in Australia remains to be seen. PNG’s loose party politics leads to perpetual government by a series of unstable coalitions.